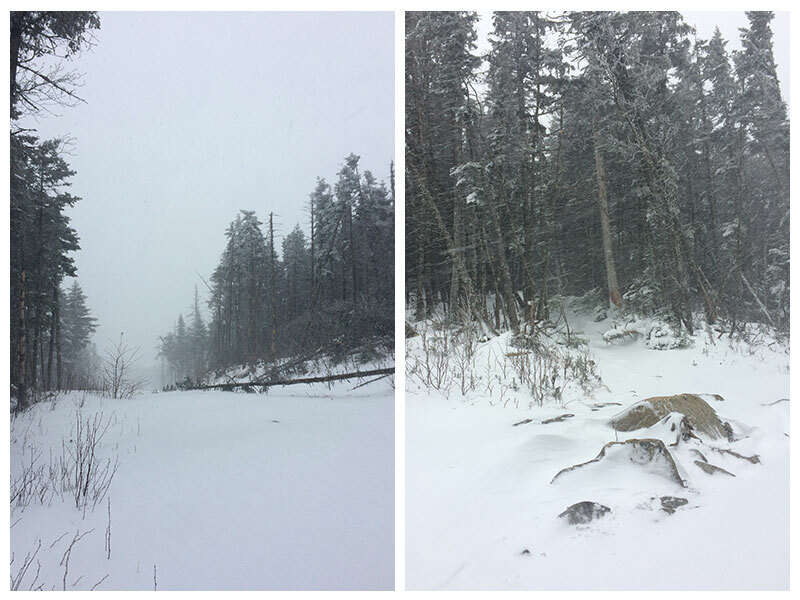 So this is a first: I’m writing about a hike that I didn’t actually make it to the summit. And no, it’s not because since I’ve now done the 46 I feel like I need to shake things up a bit and only climb partway up the mountains. I wasn’t going to write it because I didn’t take that many pictures (hands were too cold to fumble with such things) and the obvious didn’t-finish aspect but I changed my mind because I figured this could just make a point about the important choices you are sometimes faced with on a “harmless” day hike. 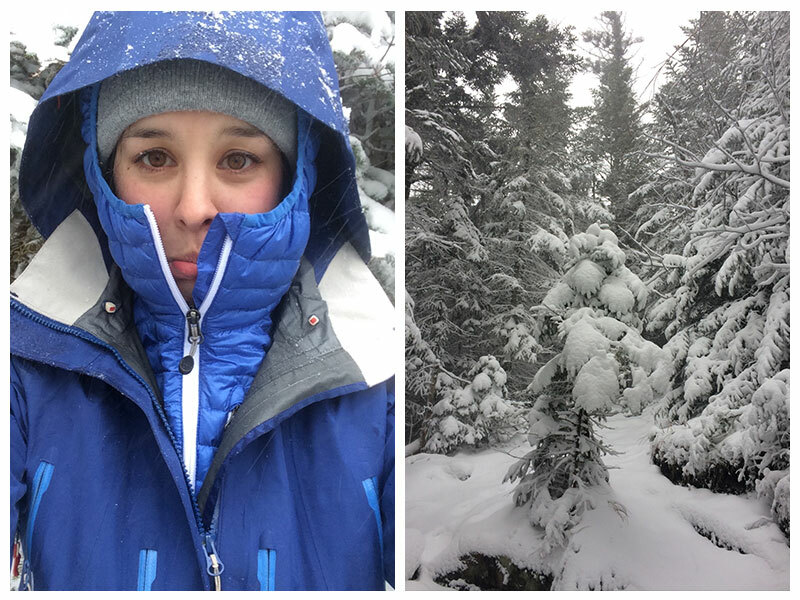 The questionable decisions: we got a late start & we didn’t have our full winter hiking gear. The good decision: we turned back just short of the summit. The end result: we made it back safely and nothing actually went wrong, we just didn’t make it to the top. 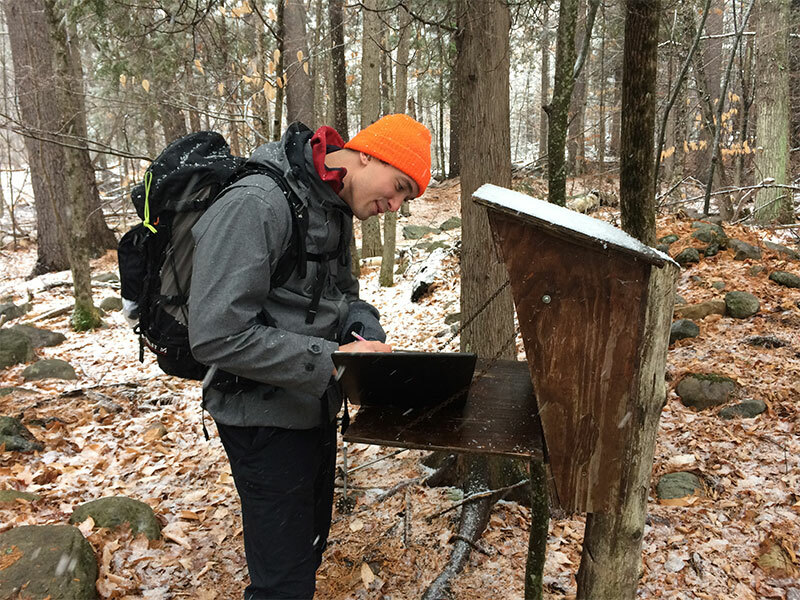 So yes, we both checked the weather forecast and saw that it was supposed to snow in the Adirondacks. But it wasn’t supposed to be too cold, and snow is fun! (Better than rain, n’est-ce pas?) When we woke up in the early morning in our cozy room in Keene Valley, it was sort of rain/snowing so we decided to take it easy. 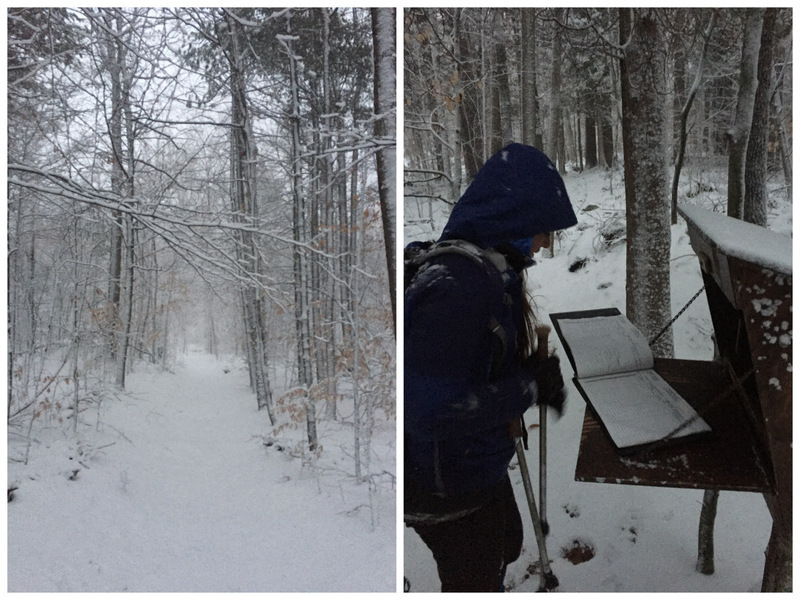 We were debating doing a different hike instead, we moved slowly, got breakfast, and then noted that it was only snowing now, so why not! We would do Whiteface! We got going from the Wilmington Reservoir at exactly 10am, and we figured we could be at the top by 2pm latest. 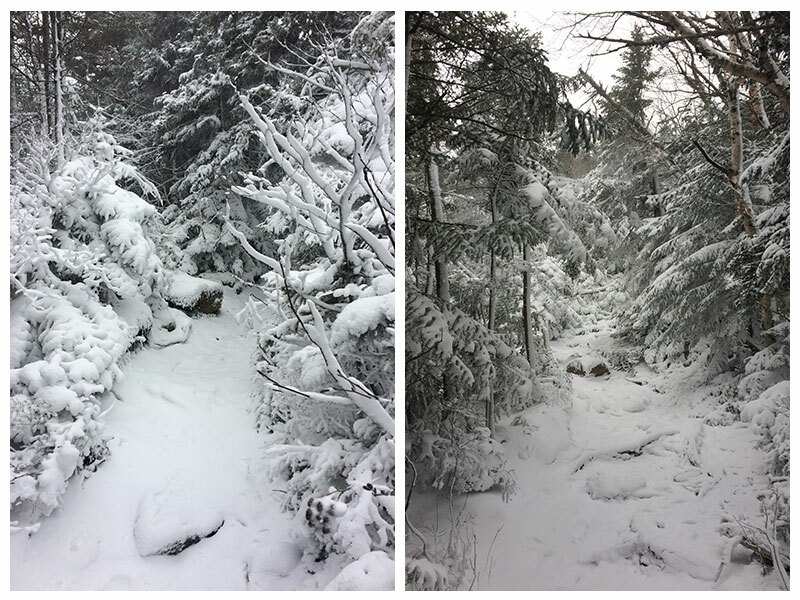 There was a layer of snow on the trail, enough to be trudging but not enough to safely cover the big boulders that litter the trail. The trail climbed very gradually in the first 1.3 miles, and we covered it in about half an hour. 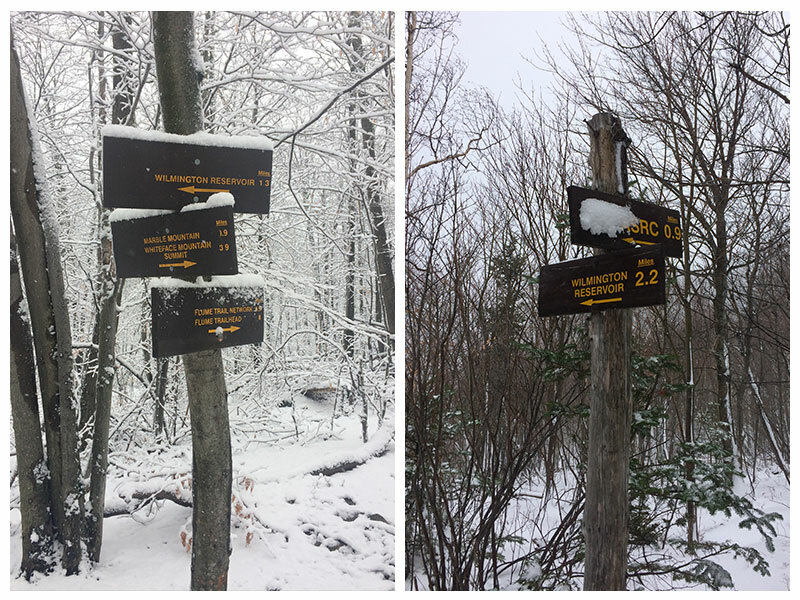 We did note, however, that it wasn’t always easy to find – 1) No one had been there before us that day, 2) There were quite a few trees weighted down by snow that were leaning over the trail 3) There was one section in particular that the trees were far apart and the cleared path became less obvious 4) The trail markers were mostly faded and hard to spot. 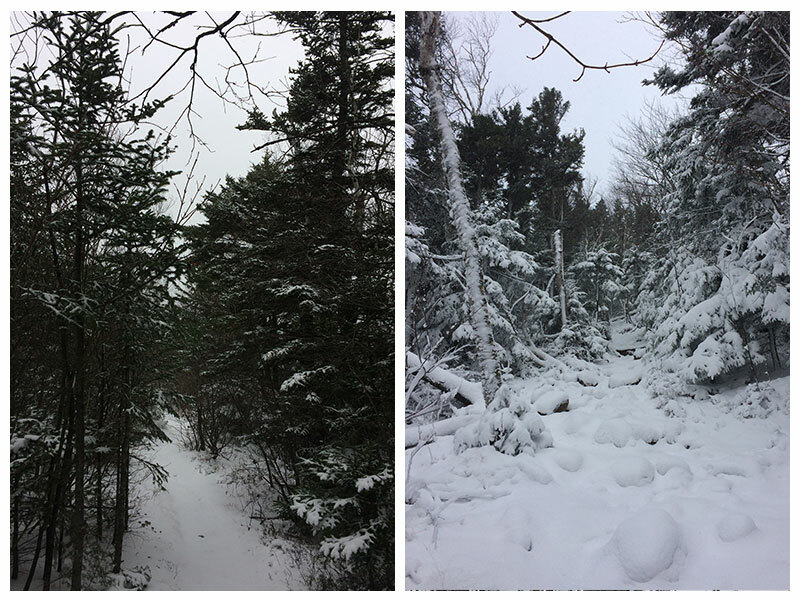 The next mile up Marble Mountain was a little bit steeper, we began slipping a bit more; the snow was powdery and the leaves and rocks beneath it were slippery. We were both using our poles and didn’t think it was necessary to stop and put on our spikes. 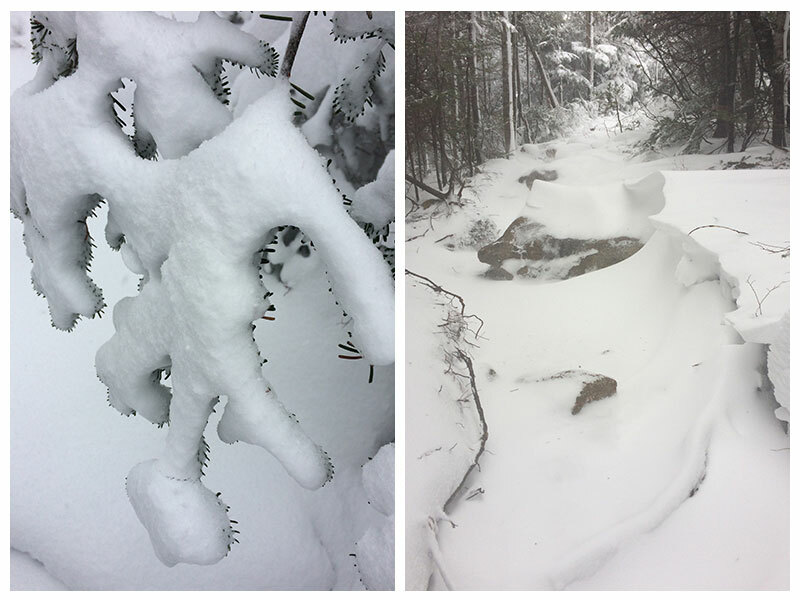 It took us about an hour to get to the junction with the ASRC trail. We were starting to wonder if this was worthwhile but it was still pretty early so we figured we may as well keep going. 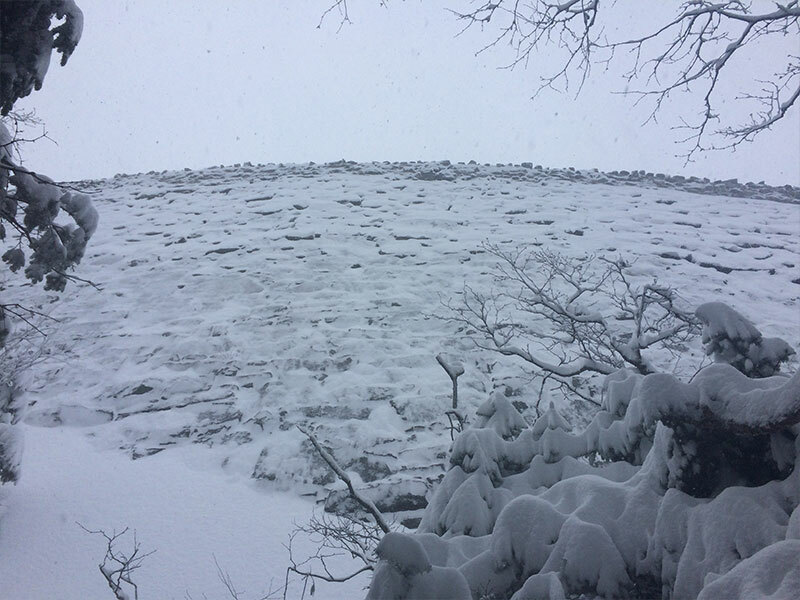 It started to snow even harder and as we climbed I could feel the air/wind getting chillier. Unfortunately, a combination of fast packing and lack of concern for the weather led to unpreparedness and I didn’t have some of my usual winter gear; many people would find me excessive but I get cold easily and usually bring a ski jacket and big mittens and I was really missing them even though it was only November. 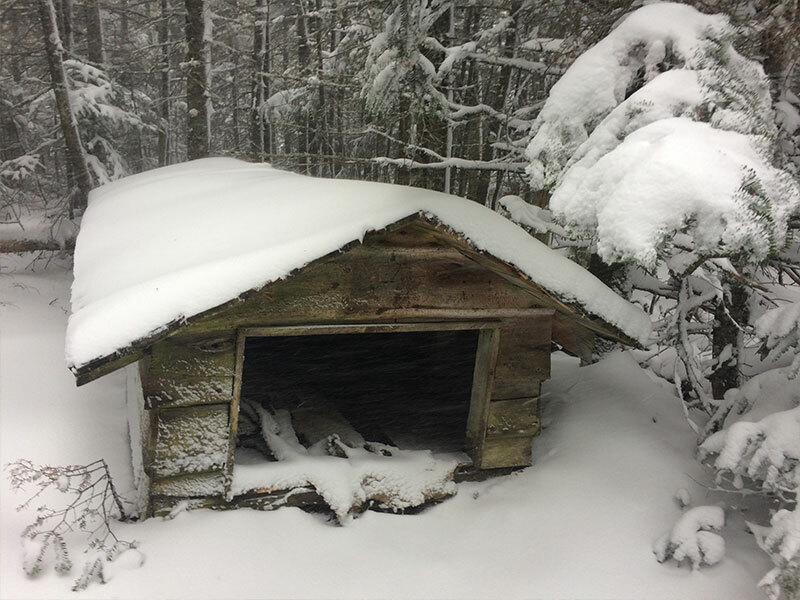 Finally, around quarter to 1 we passed the familiar sled shed and then reached the trail to Esther!! I happily sat down and we shared some hot chocolate while looking over the guidebook. 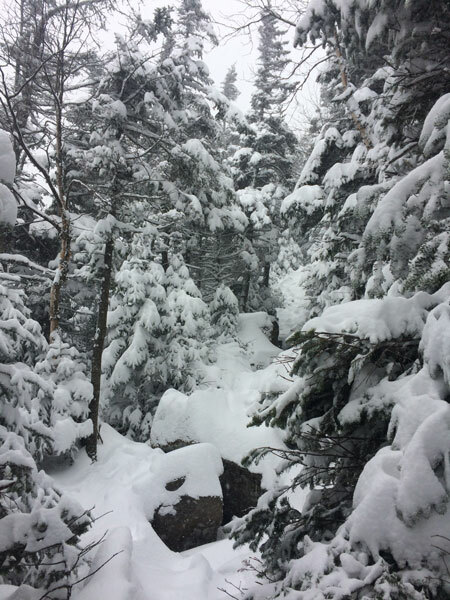 We knew we weren’t so far, I remembered (from reading the blog that morning) that my dad and I had gotten from the summit of Esther to the summit of Whiteface in icy conditions but we were already seriously doubting we were actually going to do it. We both firmly agreed that we felt zero need to actually reach the top today but that we were happy to keep going and see how far we could get. It was too cold to sit around for too long so we kept moving after about 10 minutes. We FINALLY passed the ski run soon after (I clearly remembered this part and had been wondering if/when we would reach it) and could not believe how windy it was on that exposed run. 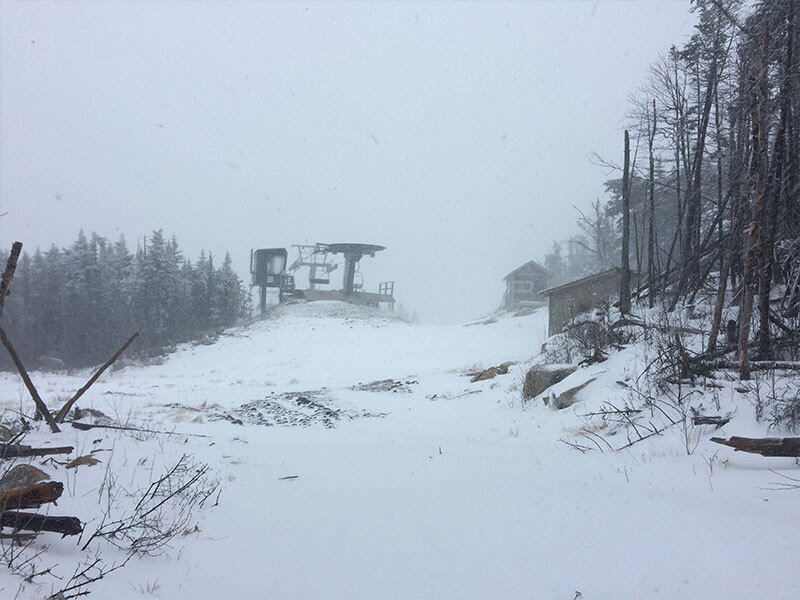 The chairlift was not running, and we joked that even the skiers weren’t crazy enough to go out on this “pow day”! 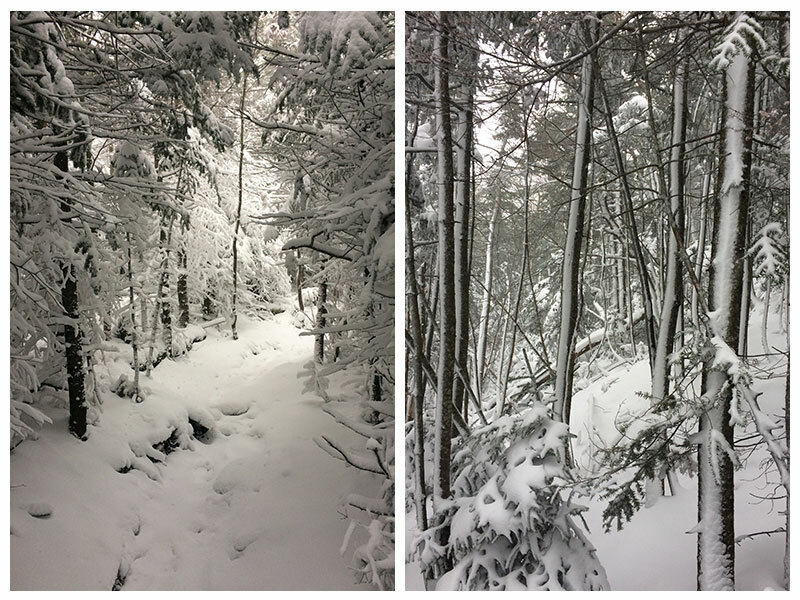 The snow was whipping so it was hard to see – and I made a mental note that I would have to replace the ski goggles that I somehow lost in my house last year if I wanted to go winter hiking again. We snapped the photo and then turned right on down, neither of us feeling at all sad or disappointed with our decision. 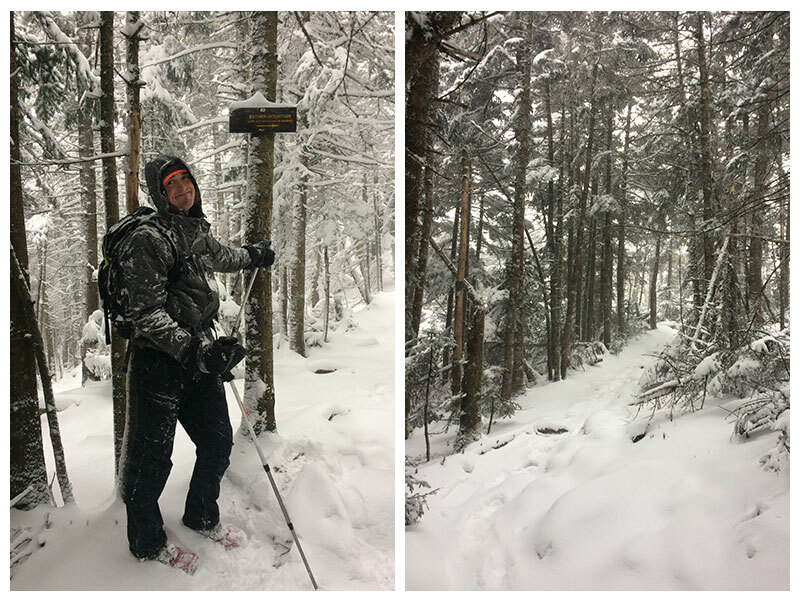 We made our way back relatively easily, using our poles to avoid slipping too much. 50 minutes later we walked past the Esther sign again. Another thing I was unprepared for: getting snow and ice off the car. Luckily Greg had his brush!!! For those who are curious, here is my usual winter hiking packing list. 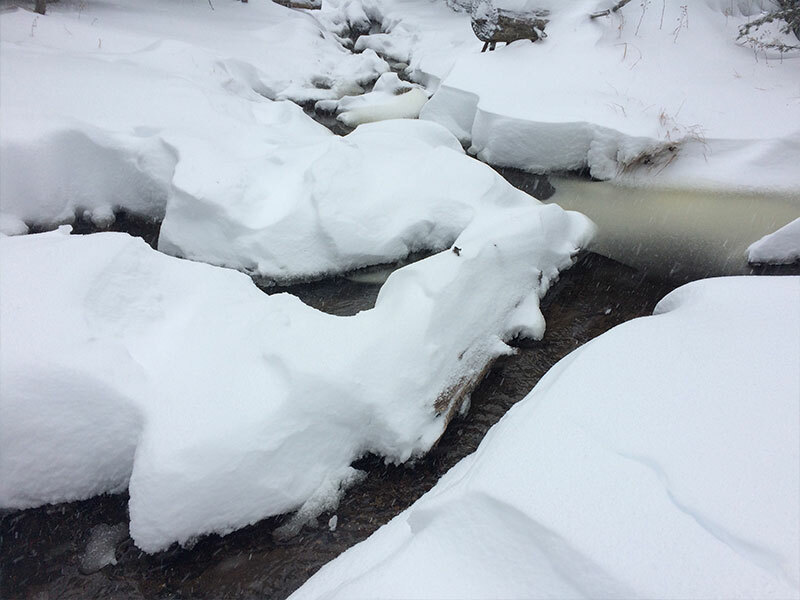 This entry was posted in Wilmington Reservoir and tagged 46 High Peaks, Adirondack 46er, Adirondacks, Adirondacks Photography, Adirondacks Winter, ADK 46er, High Peaks, High Peaks Hiking, Hiking, Hiking in the Adirondacks, Whiteface Mountain, Wilmington Reservoir, Winter Hiking. Bookmark the permalink.